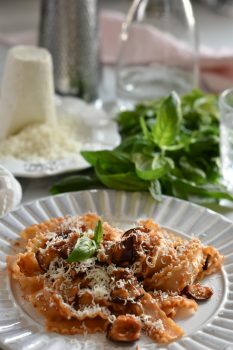 I had made this pasta dish even before my first real gastronomic trip to Sicily and I was immediately taken by its flavours. I do love aubergines in many forms, so this dish is served very often at our table. Cut the aubergines into 3 cm cubes, sprinkle them with salt (around 1 teaspoon) and leave in a colander for 2 hours to drain. After 2 hours heat the vegetable oil in a pan to 180 C. If you don’t have a thermometer, you can test the oil by dropping in some breadcrumbs. If they start to sizzle immediately, this means the oil is ready. If they turn dark and burn very fast then the oil is too hot. Gently squeeze the excess water from the aubergines and start to fry them in batches until golden (don’t overcrowd the pan). Drain on kitchen towel and pat dry. Next finely chop the garlic and gently fry it in a pan with olive oil. Reduce the heat, add the tomatoes or passata, tomato puree and simmer until smooth. Now add the aubergines and stir very well (you can squash a couple of aubergine cubes to mix the flesh with the tomato sauce) season with salt and pepper, add half of the basil leaves and keep warm (on a low heat). In the meantime, in a separate pan, bring enough salted water to boil and start cooking the pasta until al dente. Reserve half a cup of the cooking water for later, you may need it to dilute the sauce if too dry. Once the pasta is ready, add it to the sauce along with the remaining basil leaves, stir very well. If the sauce is too dry (to your liking) add some reserved water. Divide the pasta onto the plates, sprinkle with the salted ricotta and it is ready. I hope you like it!